Zulu knots are widely considered to be among the more ethnic hairstyles for African Americans. As the name implies, the style originated in the Zulu tribes of southern Africa. The style is simple, yet dramatic and one of my personal favorites. Begin with clean, tangle free hair. Have your child sit in front of you and determine the placement of the parts. Zulu knots can be formed from hair divided into either square or triangle shaped sections of hair. The size and number of the sections of hair are personal preference. 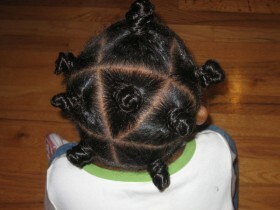 For the example here, the childs hair is divided into large triangles. Draw straight parts with a rat tail comb. Once all parts for the section have been drawn, secure the hair around the section with styling clips to keep it out of the way. Apply pomade to the section on which you are working and secure closely to the head with ouchless elastics. Be careful here. Secure too loosely and the style will not hold; too tightly and the scalp will become irritated, dry and itchy. If small bumps form near the part line, you have secured the section too tightly. With the fingers from one hand placed at the base of the twist, wind the twist all around, forming a knot. Twist the very end of the hair securely around the base of the knot. Repeat this procedure until all hair is divided into sections and knotted. The length of time the knots stay in place is somewhat dependent on the texture of the hair, but if one pops loose, it is a simple and quick matter to re-twist it. I have also experimented with wrapping another elastic around the base of the knot a couple of times to help hold it but my favorite solution is to take a moment each morning to place small, colorful clips at the base of each knot. My girls love it too! Coming soon: Lets Hear it For the Boys: A Visit to an African American Barber Shop! *Sherri Gragg is a freelance writer and mom to five, two of whom are adopted from Haiti. She blogs at www.everydaymiracle.wordpress.com and offers a wide selection of resources for adoptive and ethnic families through her Amazon store at www.sherrigragg.com. 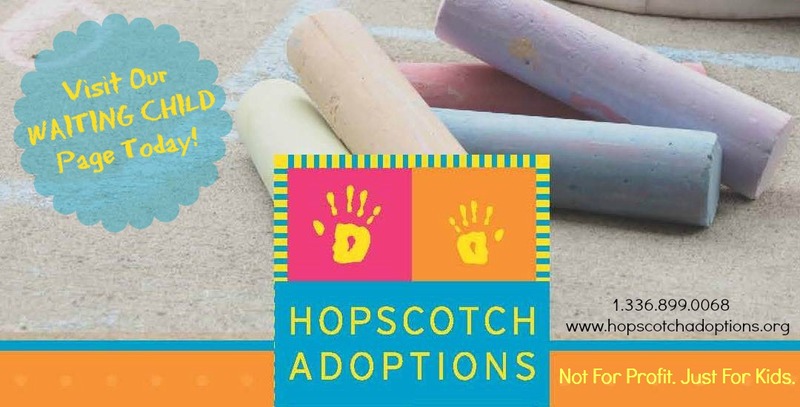 Sherri is a member of The Voices of Adoption community.